FIFA is rolling out a global strategy to grow the women's game in advance of next year's World Cup in France. Soccer's governing body has been ramping up its attention to the women's side of the sport for the past several years, partly in response to calls for more equity. The result is a five-pronged proposal that starts at the ground level among FIFA's 211 member associations, FIFA Chief Women's Football Officer Sarai Bareman said. "I think we're trying to change the perception, that women's football is not this kind of poor little sister waiting for the handout from the big brother of men's football. We want to bring it into the mainstream," Bareman told The Associated Press on Wednesday. "And it may be controversial to say this, but ultimately we're trying to do ourselves out of a job here. And it may not happen in my tenure. But there shouldn't be a need to have a Women's Football Division inside FIFA. Because everybody in FIFA and across football's the governing bodies, should be looking at football as just football." The framework of the strategy launched Tuesday was approved by the FIFA Council last year and is linked with the FIFA 2.0 vision statement unveiled by Gianni Infantino in 2016 after he replaced Sepp Blatter as FIFA's president. Soccer's governing body wants to see women's participation double over 12 years to 60 million worldwide by 2026. A key component will be insuring all associations have comprehensive women's plans in place by 2022. 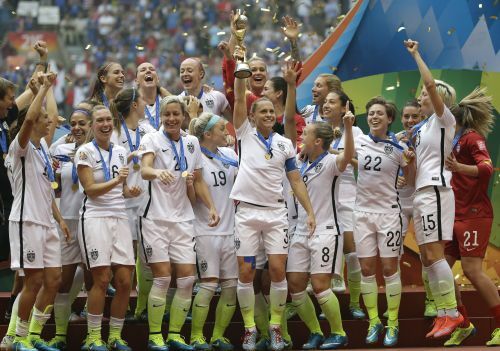 The strategy also seeks to use the Women's World Cup to drive growth. FIFA last month pledged to "significantly increase" prize money. The U.S. earned $2 million of a $15 million pool for the 2015 tournament in Canada; France earned $38 million of a $400 million pool for its men's title in Russia this summer. Prize money for the 2019 women's tournament is expected to be announced this month. FIFA has been criticized for not yet committing to using video replay to assist referees at next year's women's tournament. Video Assistant Referees were used in the men's World Cup for the first time in Russia. Bareman said a decision has not been made. Some have also complained the women's final on July 7 is the same day as the Copa America final in Rio de Janeiro and the CONCACAF Gold Cup final in Chicago, which could take attention away from the women's game. FIFA has set a goal of having a woman on the executive committee of every member association by 2026. FIFA also seeks to have women fill the seats of one-third of its committee members — up from the current requirement of one per panel. Former U.S. national team forward Abby Wambach, an outspoken advocate of equity, praised FIFA for its effort but wants more details. The release of the strategy comes two years after Infantino appointed a woman, Fatma Samoura, as the organization's secretary general, and announced the creation of a new women's football division. Bareman was appointed to oversee it. Samoura, however, did not have a very public role at the men's tournament in Russia. While Infantino advocates growing the women's game, there are persistent questions about how FIFA funding reaches women's programs. In an August exhibition between Puerto Rico and Argentina, Puerto Rican players stopping after kickoff, gathered together and pointed to their ears, protesting a lack of funding for the women's team. It's not clear how much funding Puerto Rico received from the FIFA Forward program or what it went to. The women's team did not play in one international exhibition match last year, when the team should have been preparing for World Cup qualifying. Some say they have not been paid for qualifying matches earlier this year. Puerto Rico's players were inspired by the efforts of other women's teams — including the U.S., Australia and Ireland — to secure more equitable compensation and treatment. "At this point for us, those federations and those players are at a different level than we are. We're right now just asking for the basics," Puerto Rico midfielder Nicole Rodriguez said. "Like fields to practice on that aren't water logged, and that we're not the second-choice clubs to have priority. We want friendly games so we can continue to improve our FIFA ranking and be adequately prepared. And camps, like four camps a year. We don't have any of that. So yes it would be really awesome to get paid, but right now our focus is being able to continue our development and have the respect we deserve." FIFA is communicating with its member associations about how women's soccer represents an area for growth. "One of the key things to the success of this strategy will be making sure that that message gets out. And we're seeing it — I'm seeing it a lot," Bareman said. "I see it from the increased level of investment that's going in from the member associations. We see it from more and more women's leagues that are popping up around the world. We see it from the number of teams that are starting to participate now in the qualifying pathways for our competitions. "But there's still a massive piece of work that needs to be done there. Making sure the decision makers, especially the ones who are responsible for the funding and the resources, understand how much an opportunity exists in the women's game is a big, big part of our strategy." Bareman said FIFA will start holding workshops with member associations next year. "Some countries are already well advanced in this respect," she said. "And to be honest, they're not our target. We're trying to reach those ones that need a lot more help and support from us in order to push the women's game forward." IFAB Rule changes: Is Football really going to change with these new rules?